I led this effort to cre­ate the first dig­i­tal (CD-ROM) annu­al report from a Fortune Global 500 com­pa­ny. 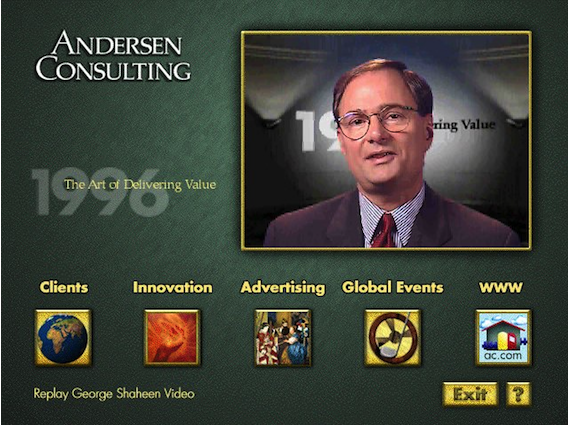 The Andersen Consulting Annual Report Companion (as it was known inter­nal­ly) includ­ed an intro­duc­tion from Global Managing Partner George Shaheen, video tes­ti­mo­ni­als from key clients, a behind-the-scenes look at Andersen Consulting’s glob­al mar­ket­ing cam­paign and even a com­put­er golf game. I over­saw all ele­ments of the project, from video shoots in a dozen coun­tries to third-par­ty pro­gram­ming teams. *On January 1, 2001, Andersen Consulting changed its name to Accenture. This sample originally was published to portfolio.kevinabarnes.com on March 15, 1997.